Spotty Storms, More Dry Than Wet. Strong Storms Tonight. A humid airmass coupled with an approaching weak cool front will spark spotty thunderstorms today. Much of the time will be rain-free with clouds and some sun. The greatest chance of thunderstorms will be toward evening and into the night. Some of the storms maybe severe, especially North and West of the City. High pressure will build in Wednesday into the July 4th weekend. More clouds than sun, humid with highs in the 70s to around 80º. A spot thunderstorm is possible just about anytime, but the majority of the day will be dry. The storm threat will increase toward evening. Some of the storms maybe severe especially away from the coast. 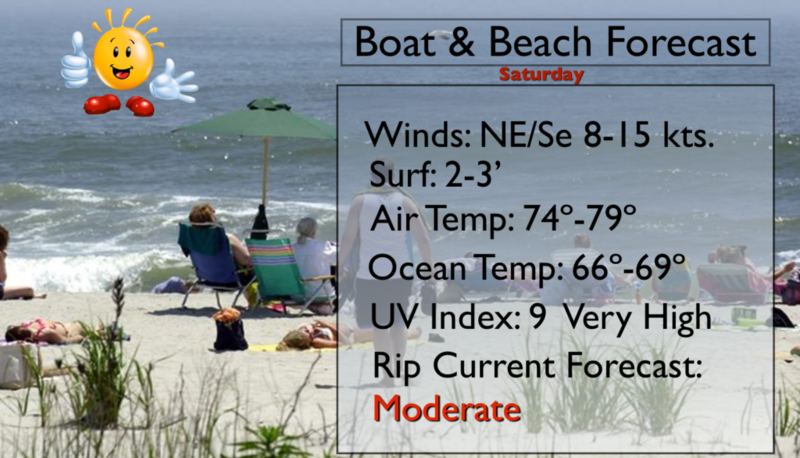 South/Southeast wind at 8-12mph. Mostly cloudy and muggy with showers and thunderstorms. Again, some of the storms may contain strong winds. Lows around 70º in the City, the lower to mid 60s inland. Southeast to Southwest wind less than 5mph. Morning clouds will give way to partly sunny skies. Becoming less humid by afternoon. Highs in the lower 80s. June’s finale will be a winner. Mostly sunny with highs mid 80s. Mostly sunny and warm for July’s debut. Readings will be in the mid 80s. Plenty of sun. Highs in the mid 80s. 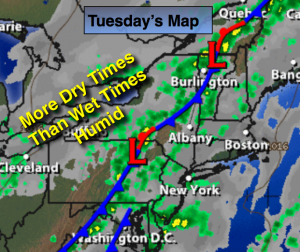 A warm and progressively more humid airmass will be over the region through Tuesday. A cool front moving into the East may spark off a late day isolated storm North and West today. A better chance of showers and storms will occur on Tuesday as the front moves in. High pressure will build in for late week. Partly sunny, warm and more humid with highs in the mid 80s. Isolated thunderstorms are possible later in the day North and West of the City. South wind at 10-20mph. Mostly cloudy and muggy. 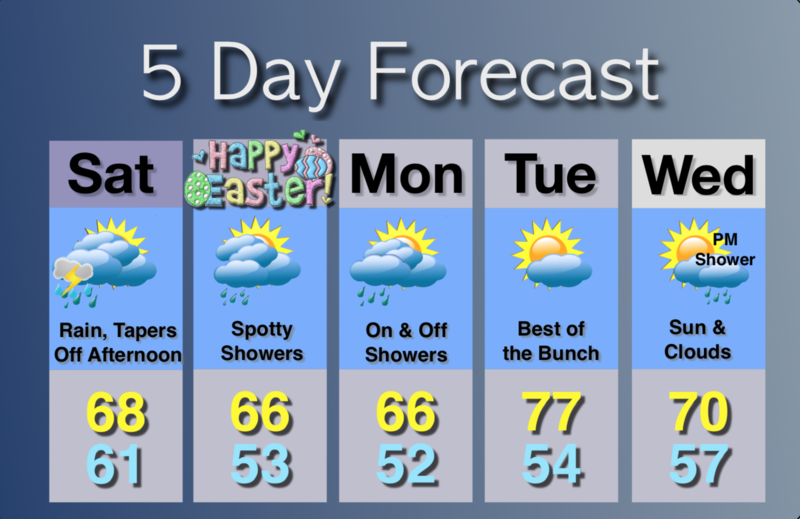 Scattered showers and thunderstorms are possible Lows around 70º in the City, the mid 60s inland. South wind less than 5mph. Mostly cloudy and not as warm. The humidity will be high. Scattered showers and thunderstorms are likely just about anytime. Highs in the upper 70s to around 80º. A morning shower East, otherwise partly sunny with lowering humidity during the afternoon. Highs in the lower 80s. Mostly sunny and warm for June’s finale. Readings will be in the mid 80s. Partly sunny for July 1st. Highs in the mid 80s. High pressure will continue to dominate our weather into Monday. A cool front moving into the East may spark off a late day isolated storm Monday. A better chance of showers and storms will occur on Tuesday as the front moves in. Sunny and warm with highs in the mid to upper 80s. It’ll be in the 70s by the shore. Southeast to South wind at 8-12mph. Clear. Lows in the mid to upper 60s in the City, the upper 50s inland. South Southwest wind less than 5mph. Sunny. Highs in the mid 80s. Cooler at the coast. A late day storm can’t be ruled out. More clouds than sun with showers and thunderstorms. Humid. Highs in the lower 80s. Drying out with plenty of sun and highs in the lower 80s. High pressure will build into the area for the weekend providing abundant sunshine low humidity with seasonally warm conditions. The next threat of showers won’t come until Tuesday with an approaching front. Mostly sunny and warm with highs in the lower 80s. It’ll be in the 70s by the shore. Northeast to Southeast wind at 8-12mph with higher gusts . Clear and comfortable. Lows in the mid 60s in the City, the upper 50s inland. South wind less than 5mph. Sunny. Highs in the mid 80s. Cooler at the coast. Partly sunny with readings in the mid 80s. Sun and clouds more humid with scattered showers and storms. High in the lower to mid 80s. A morning thunderstorm possible, otherwise partly sunny. Highs in the lower 80s. High pressure will build into the area for today and the weekend providing abundant sunshine low humidity with seasonally warm conditions. The next threat of showers won’t come until Tuesday with an approaching front. Mostly sunny and seasonal with highs in the lower 80s. It’ll be in the 70s by the shore. East to Southeast wind at 10-15mph. Clear and comfortable. Lows in the mid 60s in the City, the mid 50s inland. Winds East at 5mph. Sunny. Highs in the lower 80s. Cooler at the coast. Sunny with readings in the mid 80s. Cooler at the coast. Partly Sunny with highs in the mid to upper 80s. Sun and clouds, more humid. Scattered showers and thunderstorms. Highs in the mid 80s. It’s a much better forecast for today. A weak area of low pressure along a stationary front will result in plenty of clouds today with scattered showers mainly to the South of NYC. The sun may shine later today especially to the North of the City. High pressure will move in for the weekend providing abundant sunshine. Mostly cloudy with scattered showers mainly to the South of NYC. The sun may shine later especially to the North of the City. Highs will be near 80º. Southeast wind at 5-10mph. Becoming mostly clear. Lows in the mid 60s in the City, the mid 50s inland. Winds Northeast at 5mph. Sunny with highs in the mid 80s. Cooler at the coast. Partly sunny and more humid with highs in the mid 80s. 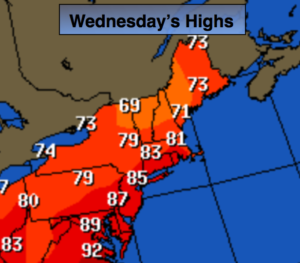 A ridge of high pressure will result in a midweek delight for the tri-state area. An area of low pressure will bring showers and thunderstorms Thursday. The punch with this system looks to take a more Southern track, if this is the case, the severe weather threat will be kept to a minimum and confined to Southern regions. High pressure will move in for the weekend providing abundant sunshine. Mostly sunny with low humidity. Highs in the mid 80s. Northwest wind at 10-20mph. Becoming mostly cloudy. A few showers are possible toward dawn. Lows in the upper 60s in the City, the mid 50s inland. Winds Northwest to East at 5mph. 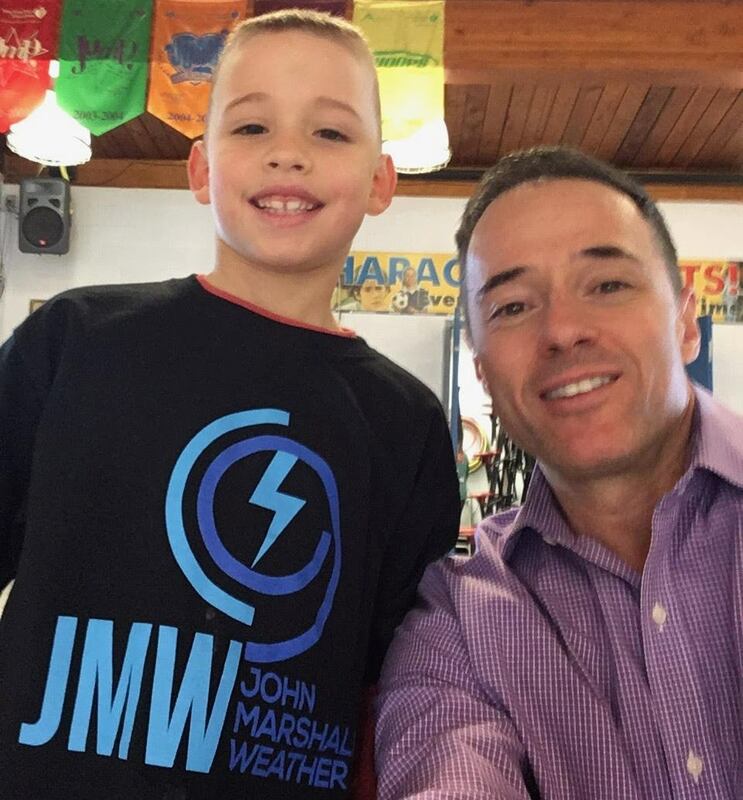 Mostly cloudy with scattered showers and possibly a thunderstorm. Highs in the mid to upper 70s. Mostly sunny with readings in the mid 80s. Sunny with highs in the mid 80s. Sunny and warm with readings in the mid to upper 80s. A weak cool front will move through the area today with spotty storms, much of the time will be dry. A slightly cooler airmass will move in for mid to late week. An area of low pressure will bring showers and thunderstorms Thursday. High pressure will move in for the weekend providing abundant sunshine. An isolated evening thunderstorm, otherwise partly cloudy. Lows in the mid 60s in the City, the mid 50s inland. Winds becoming Northwest at 5-19mph. 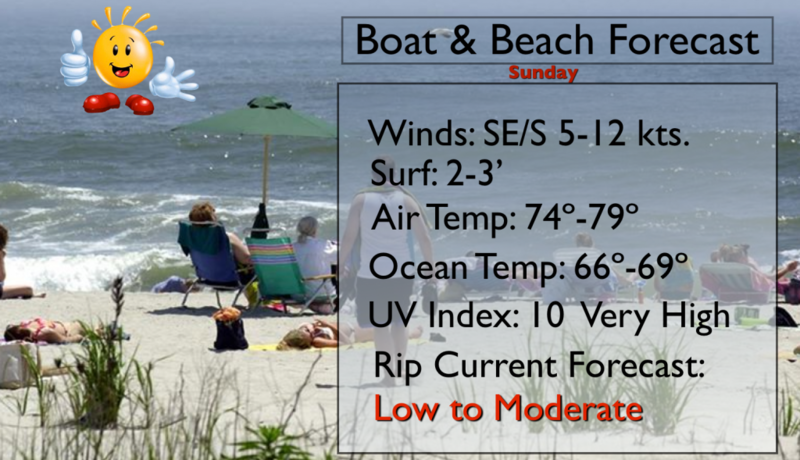 Mostly sunny with low humidity. Highs in the mid 80s. Mostly cloudy with scattered showers and thunderstorms with readings in the mid to upper 70s. Partly Sunny with with highs around 80º. Sunny and warm with readings in the mid 80s. 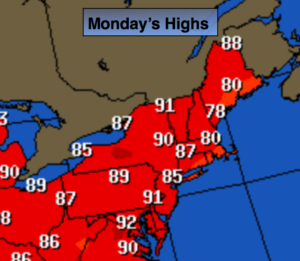 High pressure off the East coast will result in a warm to hot day today. A weak cool front will move through the Tuesday morning. A slightly cooler airmass will move in for mid to late week. An area of low pressure will bring showers and thunderstorms Thursday. Sunny and warm. Highs in the mid to upper 80s. Cooler at the coast. Southeast to South wind at 8-12mph. Summer arrives at 6:34pm. At this time the sun direct rays are at the farthest Northern point in the Northern hemisphere, at the Tropic of Cancer- 23.5ºN. Mostly cloudy with scattered showers and possibly a rumble of thunder after midnight. Lows near 70º tin the City, the mid 60s inland. Southwest to West wind at 5-10mph. Spotty morning showers otherwise partly sunny and warm. Highs in the mid to upper 80s. Mostly cloudy with scattered showers and thunderstorms with readings in the upper 70s. 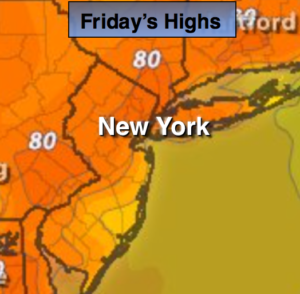 Sunny with with highs around 80º. 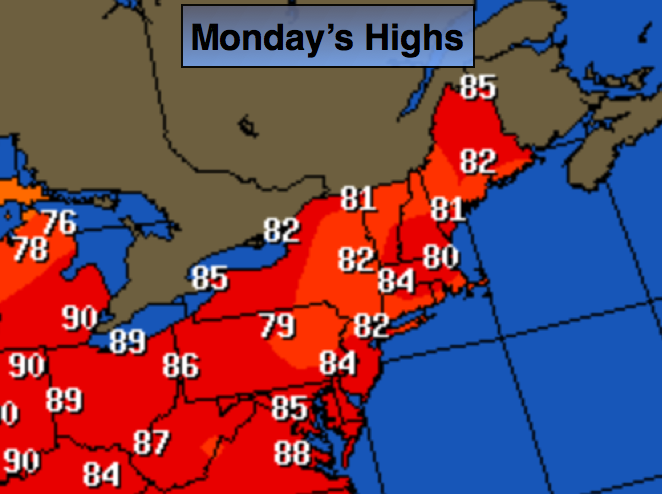 High pressure will continue to dominate our weather through Father’s Day and into Monday. A weak cool front will move through the region later Tuesday. Above average temperatures are expected through the beginning of the week. A slightly cooler airmass will move in for mid to late week. Sunny and warm. Highs in the mid to upper 80s. Cooler at the coast. South to Southeast wind at 10-15mph. Slather on the sunscreen. Clear. Lows near 70º in the City, the mid 50s to mid 60s inland. Light Southeast wind at 5mph. Mostly sunny and warm with highs in the upper 80s. Summer arrives at 6:34PM. At this time the sun direct rays are at the farthest Northern point in the Northern hemisphere- at the Tropic of Cancer 23.5ºN. Partly sunny. A spot morning shower is possible. Highs in the mid to upper 80s. Partly sunny and less humid with readings in the lower 80s. Partly sunny and seasonal with highs around 80º.